If you were to gather together all of the timber framed and thatched properties demolished in Kenilworth from the mid-1960s to the mid-1970s you could build yourself a very pretty, historic village. The area most scarred by this destruction is Warwick Road. At the turn of the 20th Century, Warwick Road still resembled the sort of quaint market town that day-trippers would today drop into for a spot of tea, albeit there were industrial buildings like the Tannery cheek-by-jowl with the cottages and almshouses. Today, Warwick Road is arguably a bit of a jumble of flat-roofed commercial units interspersed with a few remaining quaint buildings, which doesn’t really work as either a modern shopping center or a place worth taking tourist snaps. This mid-1960s ‘then’ photo shows the last days of a pair of thatched cottages, one of which is in a poor state of repair, which once stood near the junction of Clarendon Road (off right) and Warwick Road. The cottages in the ‘then’ photo were snapped by John Drew for his book Kenilworth – A Manor of The King (Pleasaunce Press, 1971) shortly before their demolition. In the ‘then’ photo we can see that the roof of the left hand cottage has a hole in its roof and its days were numbered. 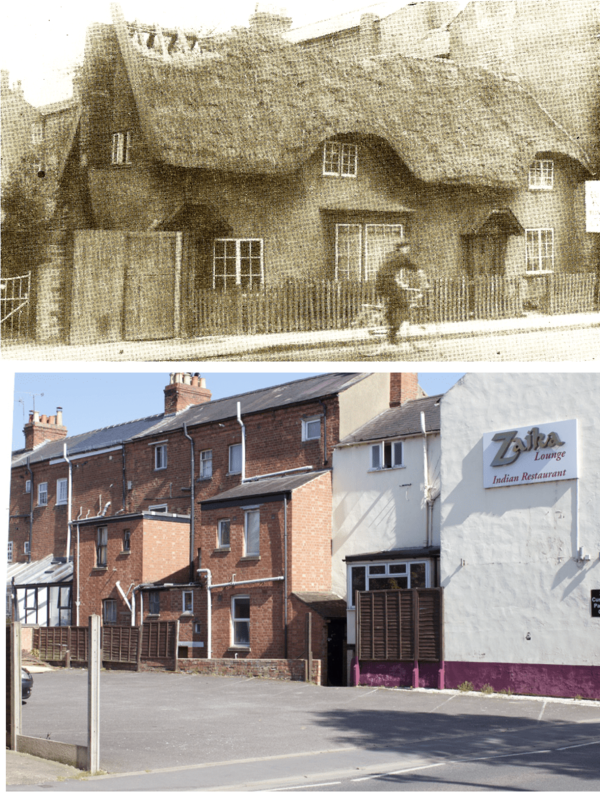 In the ‘now’ photo, the vacated site acts only as a carpark for the Zaika Lounge Indian restaurant (once known as White’s Café), which makes one wonder whether the demolition of a centuries old pair of thatched cottage was really worth it. The demolition of this cottage was carried out before it could be properly surveyed and dated. In the light of such ongoing destruction of the historic core of the town, Members of the Society took it upon themselves to investigate and record buildings with an historic fabric. For example, Steven Wallsgrove’s book The Timber Framed Buildings of Kenilworth (self published, 1994) contains a survey of 44 such timber framed buildings, surveyed by Steven, and earlier by Dr Nat Alcock, between 1981 and 1993. Many other examples had already been demolished during the modernity push of the 1960s and 1970s and some of the 44 that Steven lists have also since been destroyed. Protection by listing doesn’t seem to have begun in earnest until the early 1970s, by which time it was too late for many. Without a survey to rely upon, we can only speculate on the age and construction techniques of the cottage above. It seems not unreasonable to assume that it may have been a 16th or 17th century cottage similar to surviving examples around the town.